The last time I ordered pancakes, over the summer, I think it had been years since I’d eaten them at all, so decadent and irresponsible they seem. I ordered the stack under premise that I was going to dive in and enjoy them, butter and loads of syrup and all, without looking back. And I did, every bite, without an ounce of guilt. It truly was a treat to indulge, even if the remaining meals that day were small and measured. The type of pancakes I am talking about are the kind made from mainly flour, sugar and baking powder, which sop up maple syrup like sponges and engulf blueberries the way a glacier makes boulders look like pebbles. In other words, the kind that offer immediate gratification and little else. There is a time and place for such foods – I ordered this dish after all – and I would only add that those times and places are best left few and far between. But eating pancakes every few years is clearly a rather joyless approach. The premise is outright bleak, considering how pancakes just seem to bring a smile and general cozy happiness. Enter the quest for healthy but yummy pancakes that can be not just a reasonable part of the week, but a beneficial one. This post is sponsored by Hungry Fan™ Fangating Spice Blends, which helped crystalize a healthier pancake option. 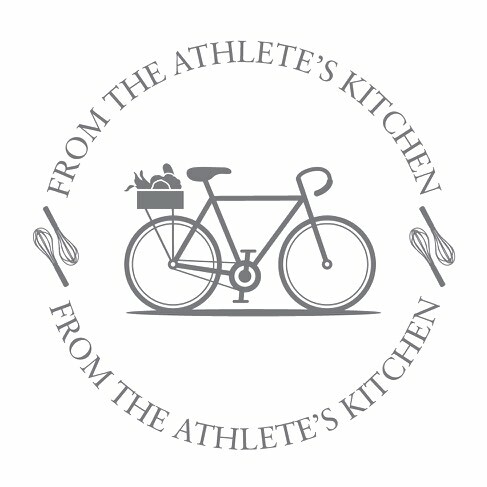 We tried pancakes made with pea protein and as much as they stack up nutritionally on paper, they are so far just not palatable. Multi-grain cakes are a decent option, but not as well-rounded. 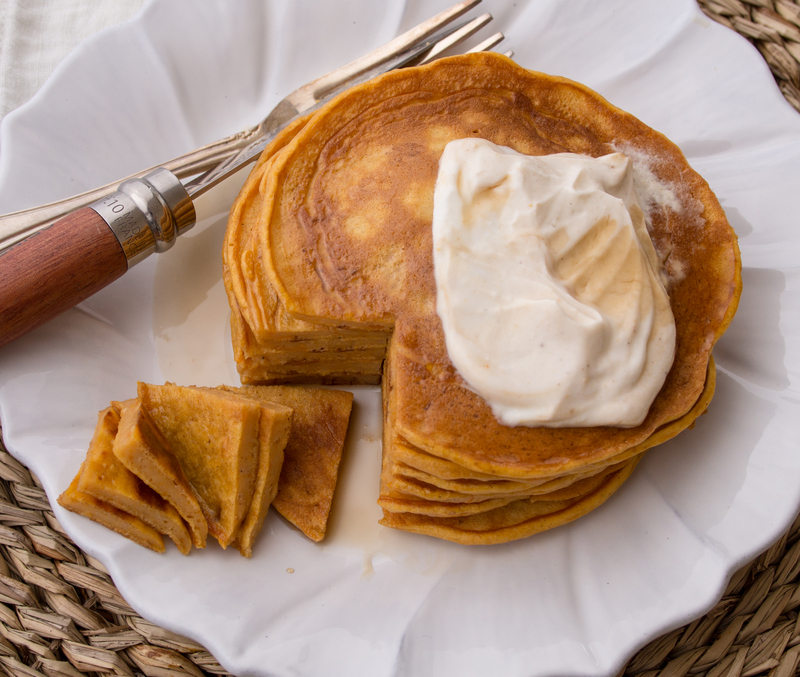 Finally, a few weeks ago, I came across pumpkin pancakes that sounded promising while editing my Healthy Athlete Feed for TheFeedFeed.com. I’ve tweaked the recipe a bit to my tastes, experimenting with substitutions and additions, I am happy to say we have a winner. They are long on protein, via Greek yogurt, and loaded with fiber, vitamins and minerals via butternut squash, all of which makes them very satiating and no-crash. That’s all very nice, but were’e talking about pancakes here, and they also have to be delicious and feel like a fun, special treat. Check, check and check. The delicious flavor starts with the butternut squash. Last year around this time I found a pumpkin pie recipe that actually doesn’t use pumpkin at all. The author emphatically claimed that roasted butternut squash is more flavorful, and with all due respect to pumpkin, I figured why not try it. The two are cousins after all, this wasn’t a total break from tradition. The result was a richer flavor profile, I think because butternut squash is a little denser than pumpkin. 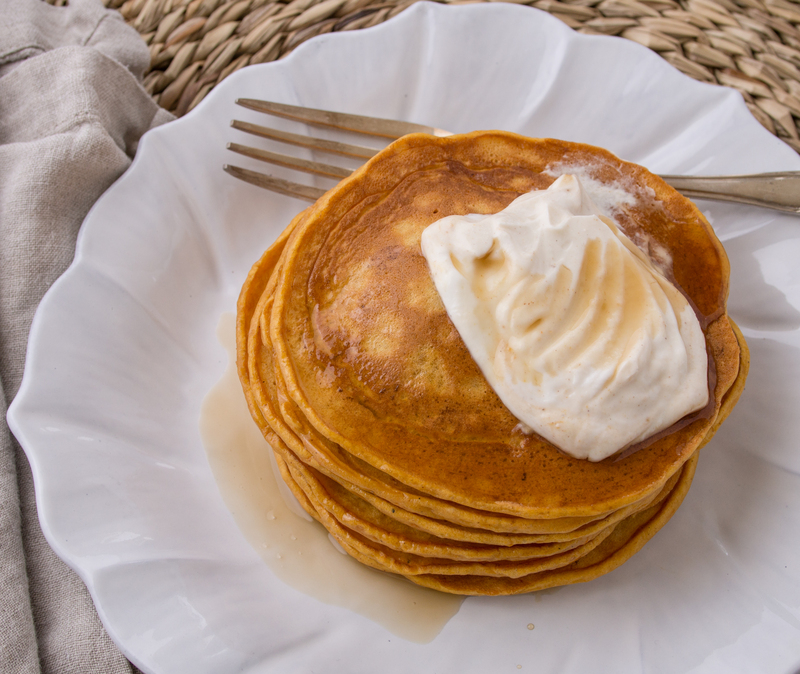 Since then I’ve had a lot of success baking and cooking with roasted butternut squash, including in these pancakes. It’s so easy to roast at home – much more so than pumpkin, since there is far less seedy sinew to remove. I’ve also used canned butternut squash in a pinch and it’s also quite good. What also builds these pancakes up to full-on fall and holiday yumminess is the spice component. Here I used Hungry Fan™ Pumpkin Spice blend, an organic mix that is so on the mark flavor-wise, I am absolved of any and all guilt for not measuring out my own individual spices. And I’ll be honest, in the name of enjoying pancakes on a regular basis, adding one measure of a perfectly balanced, carefully considered spice blend is a time saver. This recipe makes enough for one serving – yes, that entire stack is yours for the taking. These would also go really well with fruit, eggs or even something savory like ham and cheese, if you wanted to turn this into a dish for two. Put a small pat of butter (or coat with non-stick spray) in the griddle and set on a burner over low-medium heat. Add flour, baking powder and Hungry Fan™ Pumpkin Spice Blend to the mixing bowl, whisk to throughly incorporate. Add remaining ingredients and gently stir until entirely incorporated. Use the whisk to break up any lumps at the end, taking care not to over-mix. Using the spatula and ladle, scoop up about 1/4 cup’s worth of batter and place on the pre-heated griddle. Use the back of the ladle in a circular motion to help the batter spread out and create a uniform pancake. Set up as many pancakes as will comfortably fit on the griddle. Let the cakes cook slowly, flipping when several bubbles have formed and popped on the surface. Cook the other side for the same amount of time. 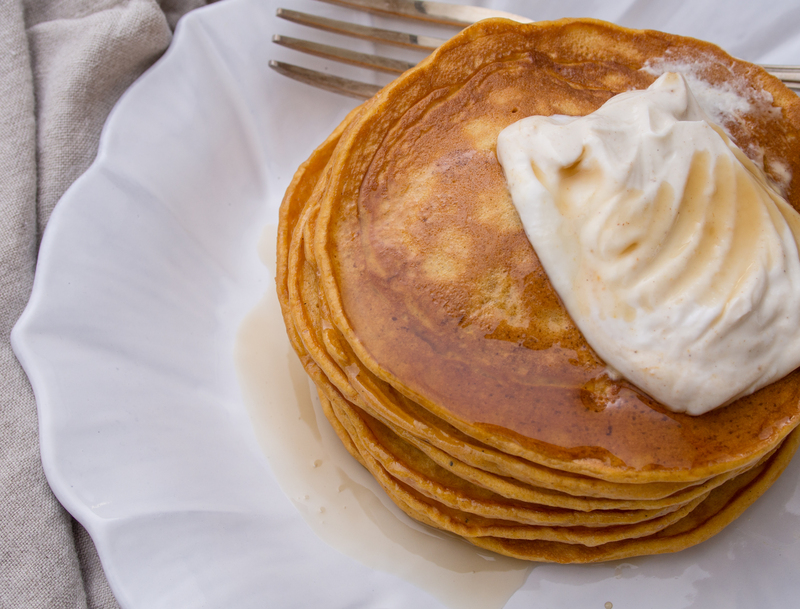 Top pancakes with the Greek yogurt blend and the remaining maple syrup.